Mmmm... cleaning out the fridge today I found some beautiful little button mushrooms that had survived almost a week without shriveling into dehydrated bits. Amazing. 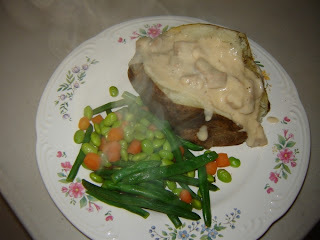 The kids wanted baked potatoes, and what better way to serve up MORE Vegan Gravy, right? I decided to use up the mushrooms and make some stroganoff gravy to go with. Large slices of portabello mushroom work well here too. Use what you have. Served it tonight with my own (slightly overcooked) custom "blend" of mixed veggies: edamame soy beans, baby carrots and few green beans left from last week's grocery trip (all rescued from the depths of the fridge). Insanely quick, and easy, and quite yummy. Melt margarine in a large pot or trusty cast-iron skillet. Add mushrooms, "beef"-style strips (if using), garlic, onion, salt, pepper and sage and saute until vegetables are soft. You may need to cover it for a few moments if they're drying out. Add 2 cups water, wine and bullion cubes to the mixture. Cook at a a low simmer, covered, for 10 minutes, making sure bullion is fully dissolved. Mix water and cornstarch, add to mushroom and broth mixture. Bring to simmer or low boil and stir with whisk, until thick. Just before serving, add vegan sour cream to the mixture, stir gently and heat through (do NOT boil) for about 5 more minutes on low heat. Serve over noodles or rice (or a potato if you want! ).